Well, the universe is at it again, messing with our minds. Last year, I wrote a blog about the Berenstein Bears, which at that time was the most recent example of a Mandela Effect. The Mandela Effect seems to be the de facto name for the idea that something that many people remember from the past is somehow changed, or rewritten. It was named for former president of South Africa, Nelson Mandela, whom many people recall having died in a South African prison, which, history now tells us, is untrue. He died, according to all of the historical artifacts in our reality, of natural causes at the ripe old age of 95. I personally have a vague recollection of hearing some news about his demise in prison, but I can’t really place it. That’s the thing about memories; they are completely fallible. When one remembers something, according to research, one is not remembering the original event, but rather the last time that you recalled that particular memory. As such, memories are subject to the “whisper down the lane” syndrome of changing slightly with every recollection. So, my vague Mandela recollection could easily have morphed from a confluence of news reports and “Mandela Effect” claims that I have heard over the years. However, that does not at all explain why large numbers of people would have the same memory of something entirely fallacious. Which brings me back to the latest of this genre of anomalies: Did Dolly Have Braces? The 1979 James Bond film Moonraker featured a character named Jaws, a huge henchman with metal teeth played by the late Richard Kiel. In one scene, Jaws’ Brazilian cable car crashes and he is helped out of the rubble by Dolly, a bespectacled young blonde woman played by the French actress Blanche Ravalec. There is one of those movie moments that any Bond aficionado will recall, when Jaws first looks at Dolly and grins, bearing his mouthful of metal. She looks at him and grins, showing her mouthful of metal braces, and therefore, as the music swells, they fall instantly in love and walk off hand in hand. At least that’s the way we all remember it, myself included. The only problem is that if you watch the scene today, Dolly has no braces! So, here, it seems, the universe (ATTI, all that there is) is really messing with us, and didn’t even bother to clean up all of the artifacts. First, a quick comment on the word “universe” – the underlying “real” universe is what i call ATTI (all that there is) to distinguish it from the physical universe that we know and love, but which is actually virtual. This virtual world is all a subjective experience of our true consciousness, which sits somewhere as part of ATTI. Hence ATTI can modify our virtual world, as could another conscious entity within ATTI (who perhaps has an evolved level of access). I’m not sure which of these is messing with the historical artifacts, but either is very possible. It would be analogous to being a programmer of a multi-player virtual reality fantasy game, and deciding to go back into the game and replace all of the pine trees with palm trees. The players would certainly notice, but they would think that there was a patch applied to the game for some reason and wouldn’t really give it a second though because they realize the game is virtual. The only reason the Mandela effect freaks us out when we discover one, like Dolly’s braces, is because we don’t realize our reality is virtual. As I post this, it feels like I am documenting something significant. However, I realize that tomorrow, this post may be gone. Or perhaps the references that I listed to Dolly with braces will have disappeared, and along with them, the original sources. And closed-minded science snobs like Bill Nye and Neil deGrasse Tyson will say it always was that way. The flaw is in the assumption that “we” are all in the same reality. “We,” as has been discussed countless times in this blog and in my book, are experiencing a purely subjective experience. It is the high degree of consensus between each of us “conscious entities” that fools us into thinking that our reality is objective and deterministic. Physics experiments have proven beyond a reasonable doubt that it is not. 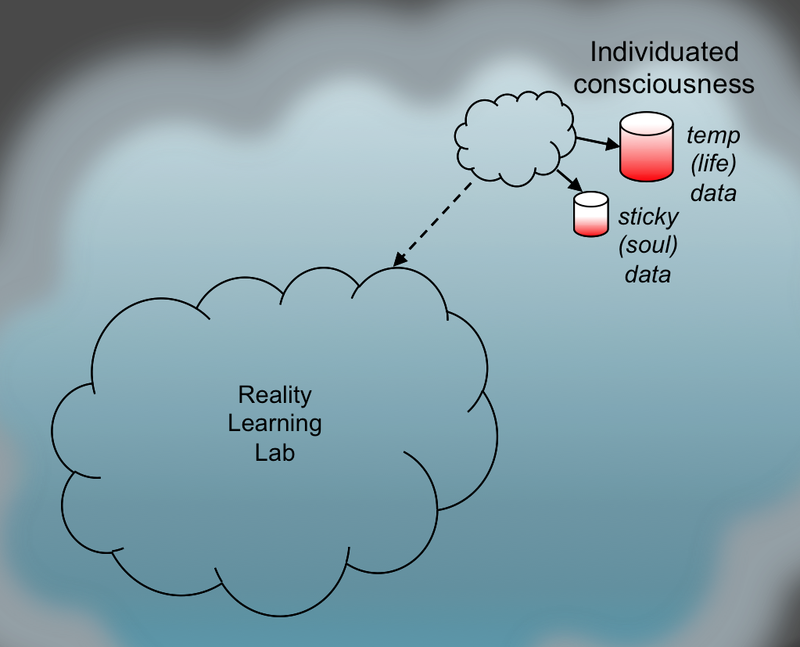 My own theory, Digital Consciousness (fka “Programmed Reality”), has a much better, comprehensive, and perfectly consistent explanation (note: this has the same foundation as Tom Campbell’s theory, “My Big TOE”). See the figure below. The “brain” part of the simulation. Think of this as our cache. The temporary part of our soul’s record (or use the term “spirit”, “essence”, “consciousness”, “Being”, or whatever you prefer – words don’t matter), which we lose when we die. This is the stuff our “brain” has full access to, especially when our minds are quiet. The permanent part of our soul’s record; what we retain from life to life, what we are here to evolve and improve, what in turn contributes to the inexorable evolution of ATTI. Values and morality are here. Irrelevant details like whether or not Dolly had braces don’t belong. For some reason, ATTI decided that it made sense to remove Dolly’s braces in all of the artifacts of our reality (DVDs, YouTube clips, etc.) But, for some reason, the consciousness data stores did not get rewritten when that happened, and so we still have long-term recollection of Dolly with braces. Why? ATTI just messing with us? Random experiment? Glitch? Maybe ATTI is giving us subtle hints that it exists, that “we” are permanent, so that we use the information to correct our path? We can’t know. ATTI is way beyond our comprehension. Jim, this is a super interesting article! Very well thought out and articulated. And quite exactly what I needed to read today. As a writer trying to come to grips with different levels of experience/reality and memory (due to some grievous losses), I often think along these lines. Thanks! We seriously need more discussion on this. I think we should continue this topic in the forum a.s.a.p.! Did we ever do that, Mark? Any recent Mandela effects you’ve come across? The Mandela effect exists because of the necessity of the simulator to receive real time perspective from the simulated. Certain of the simulated are evolved to an awareness of the simulation for this task. We have conversations with the simulation that are interesting. Simpler explanation – we are recollections or daydreams in the mind of a godlike PostHuman entity. The date is not 2016, but somewhat later. It may be that the PostHuman entity is actually ourselves at a later date, augmented/uplifted by Transhumanist technologies. LET ME OUT LET ME OUT LET ME OUT! Nope, didn’t work, anyone know the code? Last year I had what might be called a “mystical awakening” experience. I think it was for the sole purpose of re-“minding” me that this is a story we are going through, to get to the lessons we wouldn’t otherwise remember from life to life if we didn’t experience the impact of them in this life. I think we get clues along the way of the true nature of our reality. The Dolly brace erase is not a glitch – it’s a confirmation to those who are paying attention. I completely agree. Thanks for the thought. Very interesting ….. However I believe we have it the wrong way around…. We are in a computer generated reality but we are real living beings…. We are being deceived in a massive way and the Mandela effects are the mistakes in the programme we are being deceived by… There are too many changes in too many things and the world map is not accurate… No North pole and Russia which is now huge as is Greenland…. missing Islands and new Islands popping up not to mention how now we are on the Orion arm of the galaxy instead of the Sagittarian arm…. the changes in the bible and advertisements like logos etc. are there simply because of the mistakes caused by one or two realities merging so someone has to have the changes….. You are right in what you say that we are living in a simulation but we are not part of the simulation we are just following our eyes. It seems to me that the multiverse view of things is more correct. Why would ATTI remove Dolly’s braces? A small and silly change, like removing the dash from the Kit-Kat logo. Does it not make more sense that we are on a timeline where the makers of the movie chose to omit the braces for some reason? Like in the Apollo 13 movie flip flop, the movie makers chose to use “Houston, we have a problem” in one timeline, and “Houston, we’ve had a problem” in another timeline. Geographical changes are possible and predicted in the many worlds theory of Hugh Everett. We are on a timeline of Earth where South America is 1500 miles east of where we remember it on the other timeline. It HAS to be a different timeline, history is different. Events happened differently to produce a different outcome. New history, new timeline= different outcomes. Why edit reality, when the many worlds interpretation of quantum physics fits perfectly with the perceived changes? This explains the residual evidence “residue” as well. People who have jumped from a different timeline onto this one have brought their memories with them. They use these now incorrect memories to produce residual evidence. They make comments on blogs about Kit-Kat, they spell the name Berenstein for example. People can jump onto this timeline from any time in the past, thus creating residue from the other world. Your argument makes sense, Greg. Thanks for thinking about this and providing your views. I agree that changing history for such a trivial thing doesn’t make much sense, unless you consider (as a previous commenter had) that it might just be the systems way of letting us know we are on the right path. I tend to look at questions like this through the lens of Occam’s Razor – what is the simplest explanation. The MWI theory is anything but simple – the sheer number of simulation possibilities is unimaginable for the theory to be self-consistent. On the other hand, I do think that it is possible to play out an alternative sim and it doesn’t make it any less real when you do. However, if all of the known conscious entities are in THIS one, then our consciousness must also bifurcate a zillion times to make the MWI theory make sense. Too complex for a system to have evolved using simplicity as an optimization mechanism. What if too many people are accurately observing this reality in a certain way. So when you have the tools to observe it i.e concepts of reality then it changes the reality. Feel that system is running out of processing power so can’t put everyone on the same page. One of the biggest glitches is Trump and reactions to Trump i.e Russia, Hitler etc. Moonraker is one my favourite movies of all time and watched it in drive-in and at the cinema when it came out, Jaws is one of the best villains of all time so when Jaws so Dolly having braces is a real to me as singing free Mandela at UB40 concerts. I just found you on youtube yesterday, and I am looking forward to diving in to your work. You have a great voice and delivery, and a real nice thorough outlook and clarity. I had a family newspaper, back in the 70’s, and I’ve always cared about spelling, so when my sister asked me to be nanny for her baby and five year old. I would read to them, and I remember thinking it interesting that their books were called, “The Berenstain Bears,” instead of what one would think it would be with all of the -Stein’s in the world. And I know you don’t include the one about the Challenger, but I was living in St. Thomas, USVI (that can be verified by family as well) for seven months and during that time. We were watching on TV or listening on radio, as it happened, and I remember walking outside to see if I could see anything. I don’t recall about Nelson Mandela, but I figured that a rumor about a leader in prison, might have been a ploy by one or the other sides, for either encouraging or discouraging the masses, or just a rumor. I would think Dolly had braces, but IDK. You’re great. I am just getting started reading. I just wanted to say what my recall is on those couple of items. I don’t doubt about different timelines, and jumps, at all. Thanks, Tony, I appreciate the feedback. I haven’t heard about the Challenger one – can you elaborate? I have just listened to you with Antony Peake on consciousness hour. I like the work you and Tom Campbell are doing regarding information and digital reality. There was a section in the session about the Mandela effect. Having resigned my self to the false memory conclusion you brought up the Moonraker film. Now I love the bond movies, especially the humour side, and I distinctly remember Dilky having braces. That was the whole joke. I watched the film again the other week and the scene by the crashed wheelhouse just does not have the same effect. I thought I was going crazy but this Mandela effect shows a glitch or something. Anyway I am looking forward to the new book. Thanks, Paul. Yes, I agree, that scene in the movie just doesn’t make any sense anymore! Hello, I just discovered the Mandela Effect and it completely fascinates me! In particular, I have a strange memory of the Land O’ Lakes woman on the butter packaging had more than 2 arms! I distinctly remember it but everyone thinks I’m crazy. I am convinced there has to be multiple realities and either we “slide” into them or they slide into us. Haven’t heard of that Land O’ Lakes one, but that sure sounds freaky! No, Jim. I have not discovered any new ones for months. I remember this memory so vividly. Great article. I thought I was going insane. I watched this movie at the Alpha theater many times at its release, ticket was 49c. I watched this many many times on VHS and 16mm film. I was ling in my bed last night when my wife told me about the Mandela effect and being from South Africa there I asked her what it is? She quickly explained and mentioned the braces. I have not really slept and I have been spending most of the day researching on what happened to the braces.I felt lost for a while. Thank you. Thanks for writing. And I’m glad to be of some help – everyone can rest assured that they are not going crazy! Fascinating! It’s great to hear that other researchers are coming to similar conclusions. Have you published anything on this RMFRS effect?